When I bought a used Dell Latitude D600 a couple of years it didn’t come with a power supply, so I had to get one online. I found a PSU on eBay that looked legit for $50. When I got it, when first thing I reacted to was a faint smell of electrolytic capacitor, but the PSU seemed to work well enough. As time passed by I started having slight problems with it. There was interference from the PSU when plugging it into anything audio related. (Unplugging the PSU killed the interference) This intereference was even so strong that it could make the LED on my Arduino Protoshield glow faintly. I tried plugging it into a grounded power outlet, with little difference. Later, the cable dried out and cracked open in several places, which I fixed with cable ties and hot glue. But heck, I just blamed the dry cable and smell of electrolyte on the fact that the PSU had been lying on a shelf for a few years, and in general, Dell’s crappiness. After all the thing looked and felt solid, and BIOS reported it as a genuine 90W Dell spply. But so came the day when the cable broke seroiously and I had no choice but to open the PSU and solder the cables in place. I was pleasantly surprised that the PSU case was easily forced open, until I saw the inside. The untrained eye might not be able to see what’s wrong here, so let me explain. First off, the actual PSU is mounted inside a case that is way too big. This is in itself is a clear sign that the thing is not genuine. But what’s more, do you see the 5 metal plates taped together on the side of the PSU? An advanced high precision component? Magnetic field absorber? No, that’s simply a weight with no other purpose than making the thing appear solid. 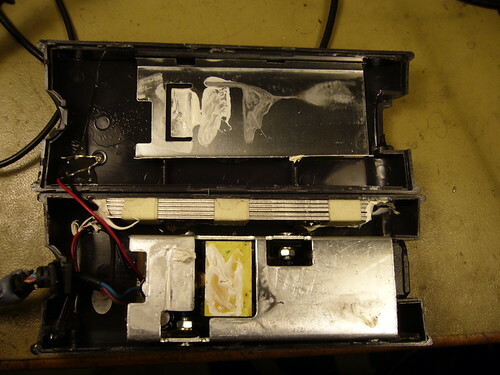 And the really crappy thermal grease that should never have survived past the year 2000. What’s a lot less noticeable is the small thing at the bottom left of the case. It’s a two-pin serial EEPROM, which only purpose is to feed the laptop a few bytes of information that will lead it to believe it’s hooked up to a genuine PSU. Let’s look under the shield. Here’s the bottom of the PCB. 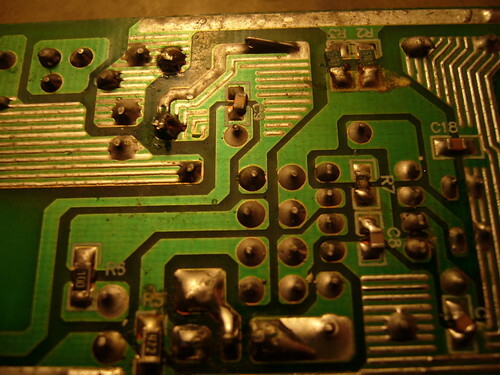 Notice how dirty the PCB is and how a lot of the surface mount components are not mounted straight. Also notice the solder joint at the bottom center where the parts of the joint have a slightly different texture one with more and one with less corrosion. 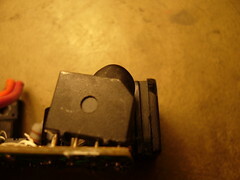 This is a sign the soldering of these two component were not done at the same time. The solution to all this? Well, I tried to fix the PSU, but gave up - it was just too crappy. So I took an authentic Dell PSU which was working but had a different connector than the one on my computer. So I spliced the cable from the PSU with the connector for the pirate PSU. 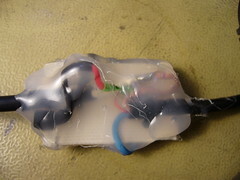 Instead of just covering the wires with shrinkwrap, I decided to splice the cables using a small board, for two reasons. 1) So I could connect the serial EEPROM and make the computer think it’s using an authentic PSU. This time with good conscience since the PSU is authentic, only that the PSU has no way of telling the computer. 2) So I could fix the cables to the board with cable ties and thus decrease the tensions on the cable solder joints. And then finish it up by covering the whole thing in hot glue for protection. Lo and behold, no more interference, not to audio equipment, not to my body (! ), not to the oscilloscope when analyzing something important. 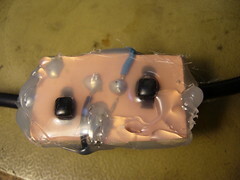 I have some of the same problems with the original power-supplies that came with my Dell laptops. One has the entire cable wrapped in insulating tape because of all the cracks. 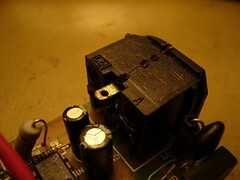 This page was previously hosted on http://gameboygenius.8bitcollective.com/wordpress/2009/10/20/the-chinese-pirate-dell-psu/ (*).